We all know the sad and painful truth, the summer is coming to an end (Waaaa). But why not celebrate it and go out with a bang? This Tuesday we are bringing you some great tips to throw an awesome end of summer bash or what to do if you will be attending one! First, you will need a killer outfit. We love these gorgeous floral rompers! They are so comfy and so flattering and look great on everyone! You can dress them up with a pair of heels and accessories, or go completely comfortable with a pair of sandals! Next you will want a good appetizer that will keep your guests happy. 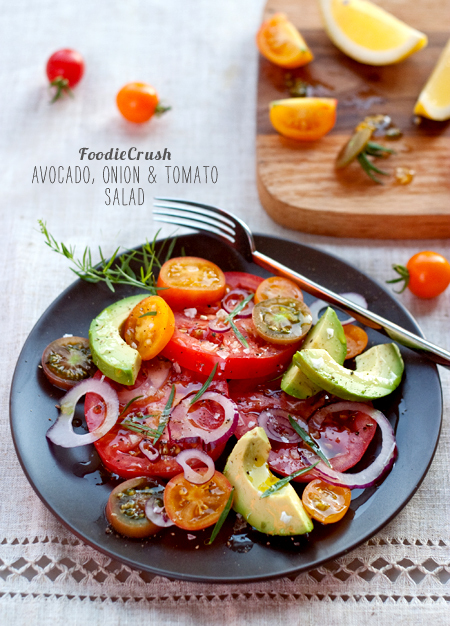 We suggest a delicious and refreshing avocado, onion, and tomato salad (click on the link above for full recipe). Put tomatoes, avocados, and sliced onion on a small plate. Sprinkle with tarragon leaves and dress with the olive oil and vinegar. Add kosher or sea salt and some pepper to taste. The olive oil is really the key and main flavor so add more to taste and make sure it's good and fruity to complement the freshness of the other ingredients. A perfect end of he summer meal are these amazing lemon garlic shrimp kabobs. It's the easiest, most flavorful way to prepare shrimp. perfect for summer roasting or grilling! 2 tblsp chopped fresh parsley leaves. Thread shrimp and lemon halves onto skewers. Place skewers on the prepared baking sheet. Place into oven and roast just until pink, firm and cocked through, about 5-7 minutes. Try these banana peanut butter ice cream sandwiches. Your guests are sure to be impressed! All you need to do is bake a batch of peanut butter oat cookies, stick a scoop or two of ice cream in between two cookies, and enjoy! Last but not least, you will need something for people to remember your party by. This cute photo booth is perfect for that! Something fun for all ages and a perfect way for people to look back and reflect on what an awesome time they had this summer. You can print out these free photo props HERE. Now you are all set to host a perfect end of the summer bash! Let us know if you will be hosting or attending a party to end the summer and if you will use any of these great recipes or tips! Okay you are making me hungry! The salad looks so good, but the banana ice cream sandwich. Yum!